The PIR motion sensor is ideal to detect movement. PIR stand for “Passive Infrared”. Basically, the PIR motion sensor measures infrared light from objects in its field of view. So, it can detect motion based on changes in infrared light in the environment. It is ideal to detect if a human has moved in or out of the sensor range. This post shows a simple example on how to use the PIR motion sensor with the Arduino. Now, you can use the PIR motion sensor in more advanced projects. 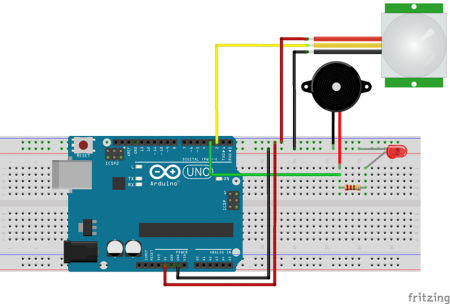 For example, you can build a Night Security Light project.